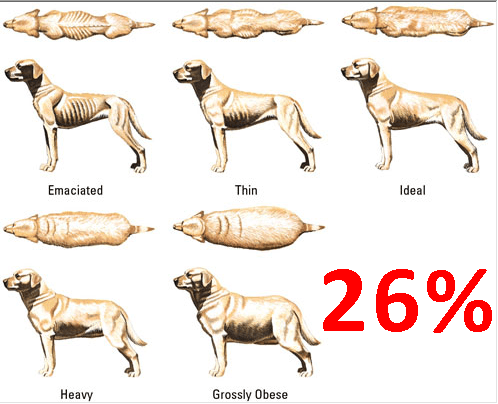 The publication of another study looking at obesity in dogs (Such and German, Best in show but not best shape: a photographic assessment of show dog body condition, Veterinary Record, 2015 DOI: 10.1136/vr.103093) concludes that 26% of the dogs surveyed were overweight. This will not come as a surprise to anyone who walks in the park or on the high street and observes the number of overfed dogs, but some may be surprised to learn that this was a study of dogs shown at Crufts. It makes a mockery of the Kennel Club’s injunctions to judges to report excessive weight and that is assuming that the judges actually notice. The KC are very keen to tell judges that they are not vets, which, although true, seems that it is more a reason for perpertuating poor health and welfare than any real attempt to root out fundamental problems in breeding and showing. When examining a dog, it is perfectly obvious if the body score is excessive and all owners should know how to tell that, never mind judges. With breeds such as the Pug, Labrador, Beagle and Basset that have a genetic tendency to weight gain, if the top show dogs are overweight, then it is likely that the dogs that the breeders sell on as pets are even more likely to become obese. Such and German don’t even wait until their conclusion to state that “breed standards should be re-defined to be consistent with a dog in optimal body condition” – they put it in the abstract. How shocking that something so obvious should need to be pointed out to breeders.